The Gadgets & Gear Giveaway has ended. We thank everyone who participated—we hope you had fun, we surely did! More exciting events are coming soon, so stay tuned. 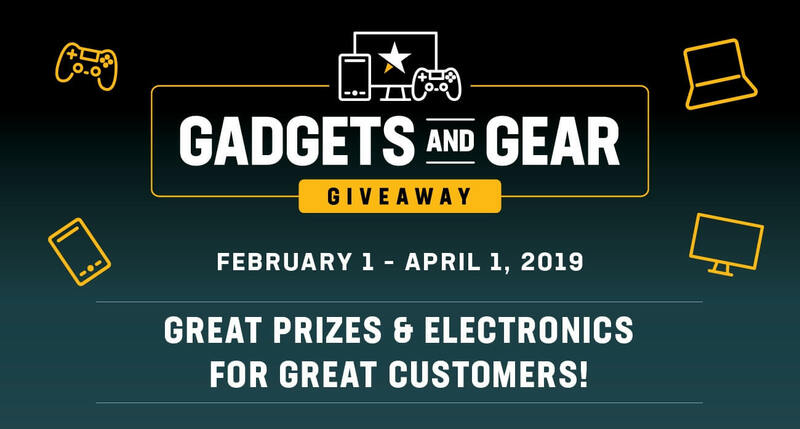 No purchase or payment of any kind is necessary to enter or win the Gadgets and Gear Giveaway Sweepstakes. The sweepstakes is open to all legal residents of the U.S. 18 years of age or older. To enter, all participants are required to provide valid, up-to-date contact information by submitting the form above. All entries must be received during the period of February 1 , 2019 9:00AM ET through April 1, 2019 6:00PM ET. The complete list of prizes and all additional information about the sweepstakes can be found in the Official Rules and FAQs documents. Prize images are intended for illustration only and don’t represent the actual prizes awarded to winners. All names, logos, images and service marks are property of their respective owners. Devices and related trademarks, logos are properties of their respective owners. By entering the Sweepstakes you agree to receive email communications periodically from Grande. You can opt-out of receiving this communication at any time by clicking the unsubscribe link in the email communication.